I was planning on working on my presentation for the EIAR Ethiopian Institute for Agricultural Research when I got up this morning but I spent the morning reading and sending emails about our meeting with the Investment Office yesterday. Abera and I really stirred a hornets’ nest with our emails. Hopefully we can use this opportunity to finalize everything with the property and move on. I was really surprised that when we arrived most of the participants were there and already registered. We didn’t even have time to say hello to everyone before Seyoum started it. It was a very good review of Embryo Transfer in Ethiopia. Dr Azage, who did the first ET work in Ethiopia, presented his work. He currently works with the International Livestock Research Institute in Debre Zeit. I talked with him on breaks. 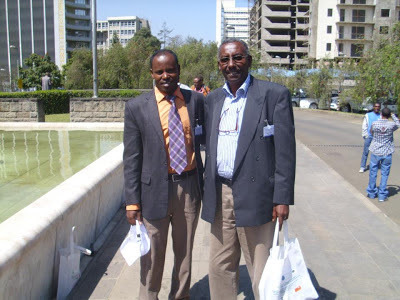 He is one of the few Ethiopians that really understands what is going on with their countries agriculture. Unfortunately he is occupied with priorities other than ET right now. It was apparent that without our help ET would still be on the shelf. The last eight years they have had many attempts to push it forward but have always been unsuccessful. At Debre Zeit they had a professor from Cuba teach them for several months without any embryos. Holeta also went through similar training without success. They were really at a standstill when we came along and gave them the jumpstart that they needed. It will be interesting to see how they proceed at this point in time. I am concerned that politics may get in the way. Overall the meeting was very positive and upbeat. My presentation was a little disjointed and ended rather abruptly. It was probably my poorest prepared presentation in Ethiopia. It was still very good but I would have liked to do better but I have to realize that I don’t have unlimited time to polish presentations. At the end Dr. Solomon gave a rousing speech in Amharic then presented gifts for Paul and me (a traditional bathrobe, an EIAR tie, and a tie tack). I was embarrassed that they focused so much on us and didn’t say anything about Dr. Azage. Afterwards he came up to shake my hand and get my contact information. I told him how I felt and he graciously thanked us for our work. We didn’t have a ride home so we hitched a ride with the Debre Zeit team. We had to wait a little while for them to get their “per diem” for attending the meetings. I told Dr. Tamrat that in the US the participants paid a registration fee instead of receiving one. He saw that you would value the education more if you paid for it.